Injecting some much-needed sunshine into this rainy week we have Roger & Gallet’s Creme Sublime Or perfumed body cream and Huile Sublime Bois d’Orange nourishing oil. Just look at those beautiful honeyed colours! I took this photo in front of a wicker hamper to make it feel all harvest festival-y, do hope that you appreciate the effort. Now that I’m not using Instagram filters I have to find imaginative ways of amusing myself. 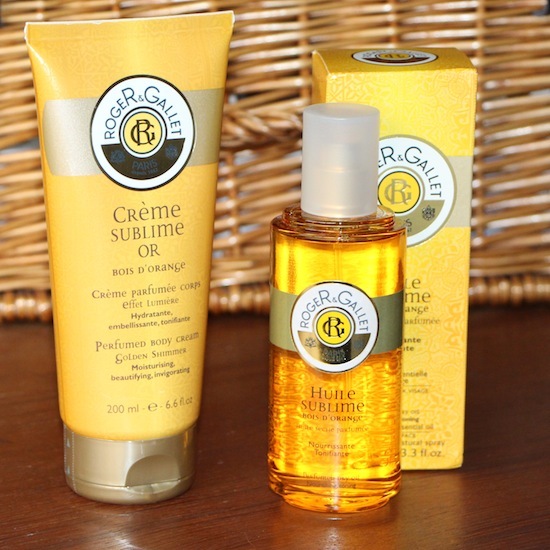 Roger & Gallet’s Bois d’Orange range is at FeelUnique here with free delivery. The dry oil is £16.10, the perfumed water is £22.40 and the cream is the best value of the lot, I think, priced at £10.50 and available here. Hello again, summer! Next Post Hotel Amour: It’s a Grower.